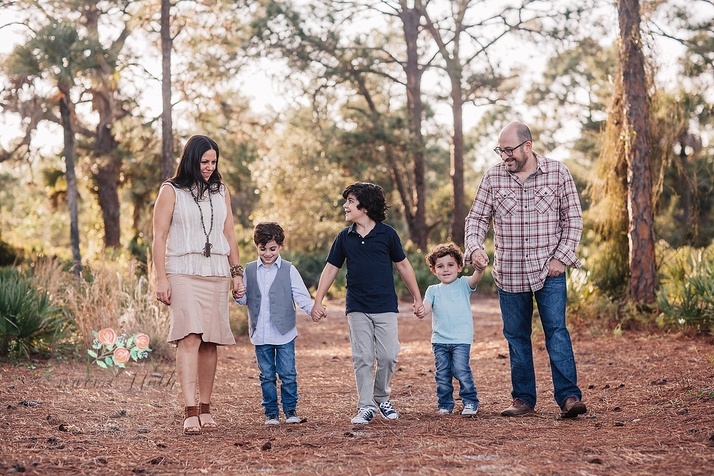 It was so much fun being a Boca Raton family photographer for the Ackerman family! From the moment I got off the phone call with mom, I knew this was going to be an amazing photography session. Mom loved the idea of using my Boca Raton rustic forest location and wanted some input on pulling together everyone’s outfits. Prior to our session we arranged an in-home consult. During this time we went through different wardrobe possibilities. We also discussed the different areas in her home where she envisioned the photography session’s art work would hang. I think the two of us did a knock out job on the outfits. I mean look at this family, aren’t they just gorgeous! The boys were so much fun to work with. They were full of energy and excitement. I allow for a lot of fun and games during family photo shoots. This allowed me to capture the real personalities of these three little men. This family was all smiles and giggles the entire photo session. 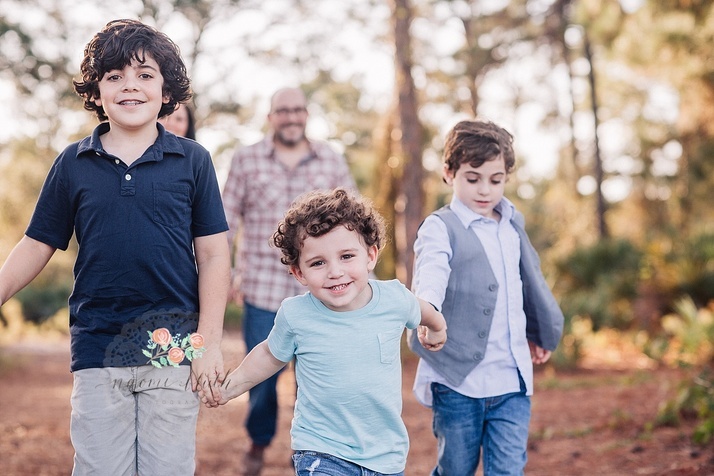 One of my favorite photos is of the three boys running in front of mom and dad, they have the most beautiful expressions on their faces. I also love the photo of mom being loved on by all her little boys! Once the session’s images were all edited I met again with mom and dad. 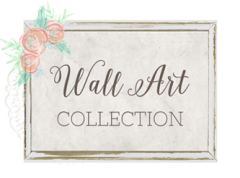 Together we designed a beautiful custom wall art arrangement. 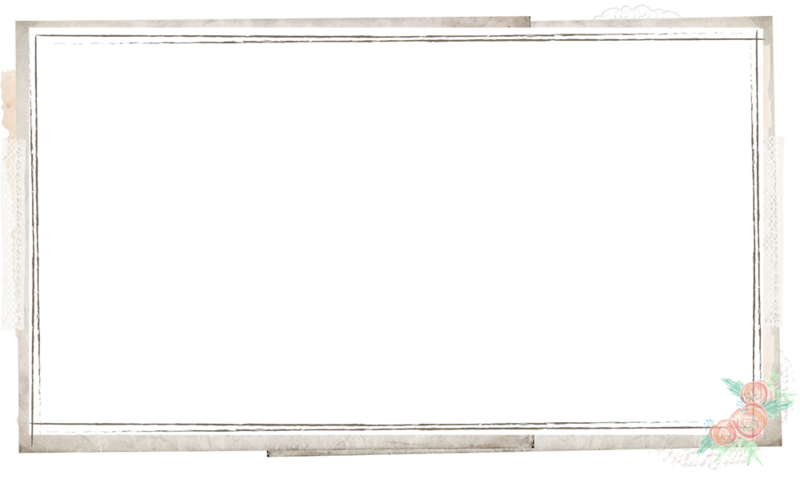 Their wall art hangs in their front hall where they are able to treasure and enjoy the amazing family memories we captured together. For more information on booking a Boca Raton Family Photo shoot, please call me at 305-479-1941 or drop me an email here. Also please check out this link for see my Newborn Photography photos. 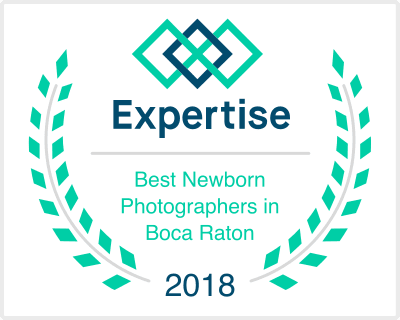 I have been a newborn photographer in Boca Raton since 2011. I like to encourage my clients to book their newborn sessions well before baby actually arrives. This secures them a spot on my often very full calendar. I do, however, fully understand just how busy and overwhelming pregnancy can be, and sometimes booking a newborn session isn’t something you think about until baby actually arrives. So even if I get an inquiry once baby has already arrived I will always do my very best to make room in my schedule, as I know how quickly those newborn days go by, and just how important it is to capture that sweet time. This was the case with baby Chase. Mom reached out to me when Chase was nearly three weeks of age. I actually prefer to shoot my Boca Raton newborn sessions when babies are between 5 and 14 days old. 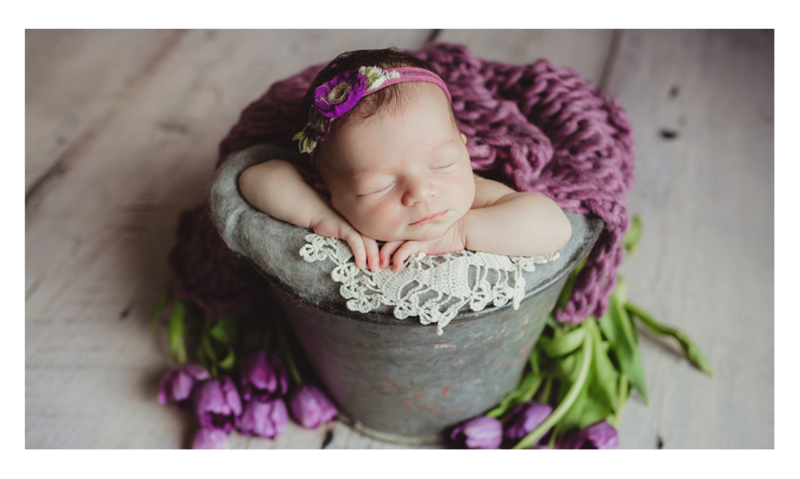 I find that that is the sweet time when baby is likely to be most sleepy and happily fed and we are able to move swiftly and easily through our newborn session. I heard in mom’s voice just how eager she was to get those newborn images and how worried she was that she had missed the opportunity. I had a tight schedule and just one morning that week available. Mom jumped on the opportunity and the newborn session was booked for my Boca Raton newborn studio. I could not be happier I was able to get Chase in for his newborn session! I mean look at how absolutely adorable he is, and oh my, those cheeks!! One of the images I love the most is of baby Chase in my “Tuf Boy” bucket surrounded by succulents I planted in vintage metal tins. I love mixing the newness of baby along side vintage and rustic props. Thank you mom for bringing Chase to my Boca Raton newborn studio! 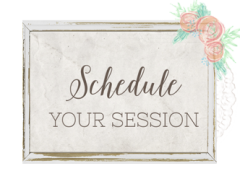 If you’d like more information on booking your very own Newborn Session, please contact me through the contact form on the website or call me at 305-479-1941. 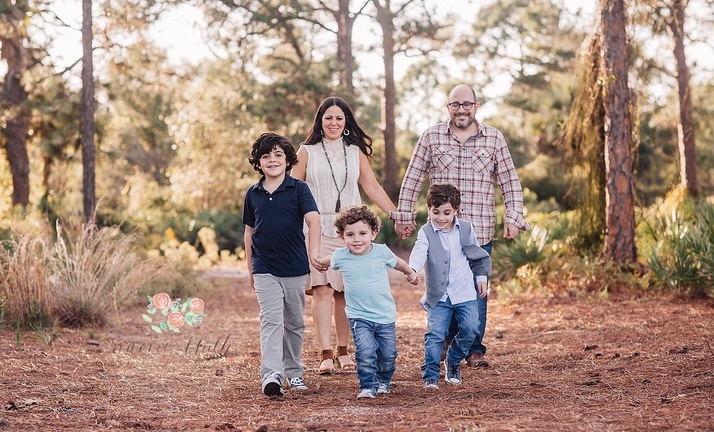 You can also schedule a Family Photo Session at one of my beautiful Boca Raton locations.